GULFPORT — Swearing to faithfully, honestly and fearlessly discharge his duties, Leonard Papania took his oath of office as the new chief of police Tuesday as his wife, Angela, stood by his side. After taking the oath administered by Mayor George Schoegel, Papania in turn swore in Deputy Chief Chris Loposser and Cmdr. Ken Brown. The mayor and Gulfport Chief Administrative Officer John Kelly had much to say about Papania’s ability to win the position over outstanding nationwide competition. Of the 65 applicants, the top six were selected for intensive interviews and testing by a committee. Papania grew up in Gulfport and has been with the force since 1991. 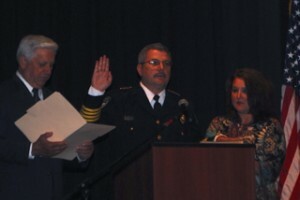 He has served as deputy chief since 2009 and has been acting as chief since his predecessor, Alan Weatherford, retired from the position in February. Papania was officially appointed chief of police May 8. Papania said he had four words to describe his approach to the office: humility, compassion, accessibility and accountability. He said the measure of a chief — to meet and exceed the standards of the force — will be decided on those awful days when tragedy strikes. But through a genuine commitment to the department and residents to exemplify the four attributes he aspires to, he said, he intends to be ready to lead whatever the challenge.